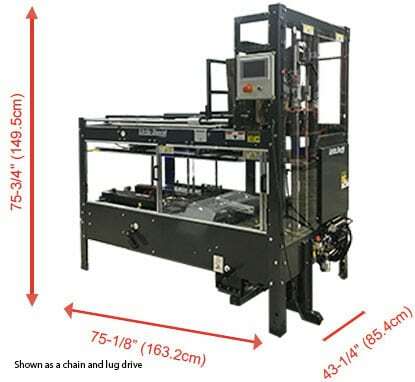 The Little David® CF-25 SB is a fully automatic, industrial grade uniform case erector designed to form and bottom seal corrugated boxes at speeds up to 15 cases per minute. With a minimum case width of 3.5”, this side belt erector was developed in response to needs from the co-packer, electronics, personal care, and pharmaceutical markets. Allen Bradley Micro 820 PLC features Ethernet connectivity, sensor functionality, jam detection and photo eye that will detect box back up in case sealer. Eaton HMI features machine diagnostics and warnings, Ethernet Port, case set up instructions, store up to 10 case size set-up parameters, dual languages. Small Footprint- Patented case flow technology allows the CF-25 SB to maintain its versatility without compromising your floor space. Reliable Case Transfer- Boxes are mechanically squared at side belt entrance. Box maintains squareness due to common shaft driven belt speeds. Quick/Easy Changeover- Load-on-the-fly/easy load hopper ensures case loading and changeover are simple and efficient. Boxes are mechanically squared at side belt entrance. Box maintains squareness due to common shaft driven belt speeds.